With P's 2nd birthday in a month family and friends are beginning to ask me what P would like for her birthday. As a mama who doesn't want one more toy - because she has about 800 she doesn't play with - these are all presents that are actually useful and will get a ton of use. So please put down that stuffed animal and try this list out for any toddler in your life instead! There are smaller boxes of chalk but at $4.99 you can't really go wrong with 48 different colors. P can play with chalk forever and it's always nice to have some spare pieces laying around. It also keeps her from using her crayons all over the wall. Win for P, win for mom. We discovered these after P swiped it from our friends house and was instantly hooked. What is so great about it is you fill the brush with water and "paint" the pictures. Once the water dries you can color the picture all over again. I especially like to get these for plane flights! Oh I can still remember these as a child! P is loving stickers lately and these are a great option to make sure they don't stick anywhere you don't want them too. Like the inside of a car window....I never understand those people. P is adamant that she holds her own bubble bottle and without fail every single time it's all over the ground and her shirt in minutes. We have the larger version of this but the mini one is where it's at. Also bubble solution is always a good gift! Bath time is a favorite in our household and getting to add a nicely scented, fun bubble bar to the water makes everyone happy. I love these big round ones because you can cut them into pieces for multiple baths. Plus I can use it if I want too also! Same concept as Colorforms (minus the childhood nostalgia) I know my little lady would squeal over this present. I like that it's contained in one book too, great for traveling. I love to shop small and do a lot of my purchases on Etsy from hair bows to outfits. This would be a unique and fun option for any toddler mom! Plus fun to see what they would pick out since the options are endless! 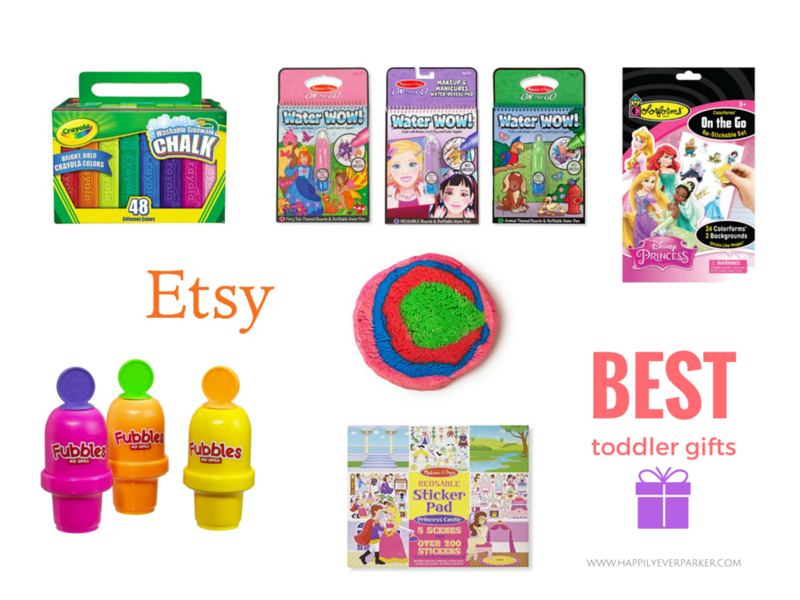 Tell me what are your favorite gifts to give and get for toddlers? Love these ideas, totally getting R one of those water books! Stuffed animals are the worst gift, I swear! We love Water Wows, especially for airplane rides. And let's be honest, you are going to steal all of P's bath bombs! The water WOW books are some of our favorites, and they're perfect to take with us when we're on the go. As for the bubbles, I admire you all for being so ambitious to blow them. I'm entirely too lazy and insist we use a bubble machine. the stuffed animal struggle is REAL. but the bubble game is strong. and water wow books FTW!